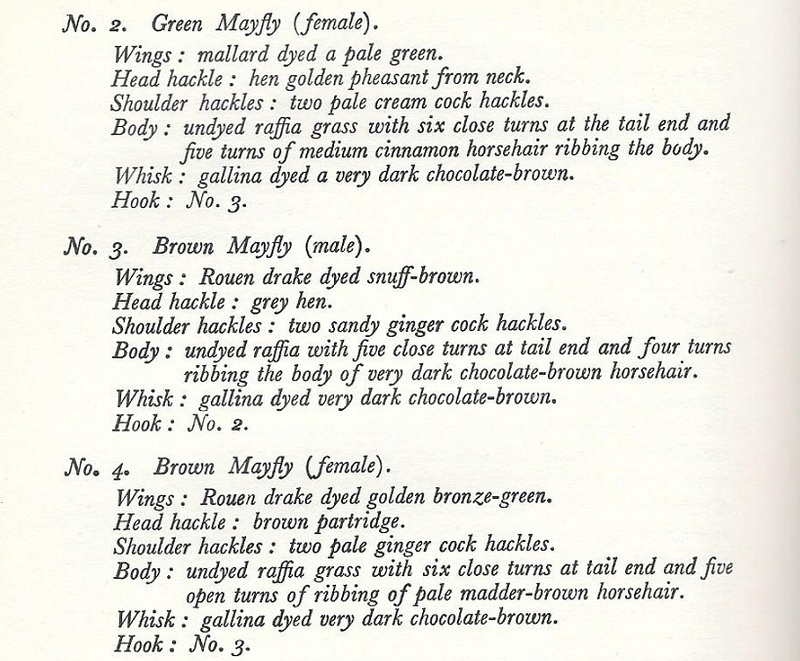 ‘The Mayfly’, Ephemera danica, has been well known to trout anglers for a very long time. It is arguably the most well known of the upwinged flies. Most trout fishermen understand that the life cycle of the mayfly follows the pattern of dun – spinner – egg – nymph – dun and that this goes on unceasingly as long as no link in the chain is broken. The phases that interest trout, and anglers, most as food are the dun and nymph. The mayfly nymph grows and moults among the streambed substrate before it swims to the surface to hatch into a dun. Once the wings of the dun are dry it takes to the air to mate. Mating complete, the female scatters large numbers of eggs into the water with the tips of their abdomens before falling spent onto the water surface (spent spinner). The eggs eventually settle onto the streambed where they hatch into nymphs. Burrowing – upon hatching the nymph digs itself into the silt, finds food there and only emerges to change its skin (e.g. the true Mayfly, Ephemera danica has a burrowing nymph). “Lots of scientific effort has been put into revealing the life history of Ephemera danica as it is a major trout food in Europe. Ephemera spends between one and three years (usually two) as a nymph or larva burrowing 10-20mm deep in the sandy and/or muddy sediment of the river bed and a brief span of days or weeks as a sub-adult or adult fly when it flies, mates and lays its eggs. The nymph itself is clearly adapted for burrowing with powerful flattened limbs that are used to shift sediment and create an unconsolidated, semi-permanent, horizontal burrow in which the animal resides. The limbs and body have a dense covering of strong bristles and hairs which form a sort of cage to prevent the collapse of sediment from the walls of the burrow. The featured image for this article shows this clearly. The upper surfaces of segments II to VI of the abdomen are each furnished with a pair of two-branched, feathery gills which in life undergo rippling movements designed to force a powerful current of water towards the rear end of the animal. This pumping action of the gills draws water into the front of the burrow which is loosely covered by sand particles supported by the stiff, bristly antennae. The inflowing water passes beneath the body of the animal which, by doing a sort of ‘press up’ with its hairy legs, has created a tubular feeding space. The water current then passes up under the hind limbs and is forced out through the sediment towards the back of the burrow, deflected by the gills of segment VII and the upturned tip of the abdomen. The mayfly larva is a detritus feeder and by stirring the sediment in front of its head with the comb-like claws of the front legs it creates a cloud of only the finest particles suspended in the feeding current. 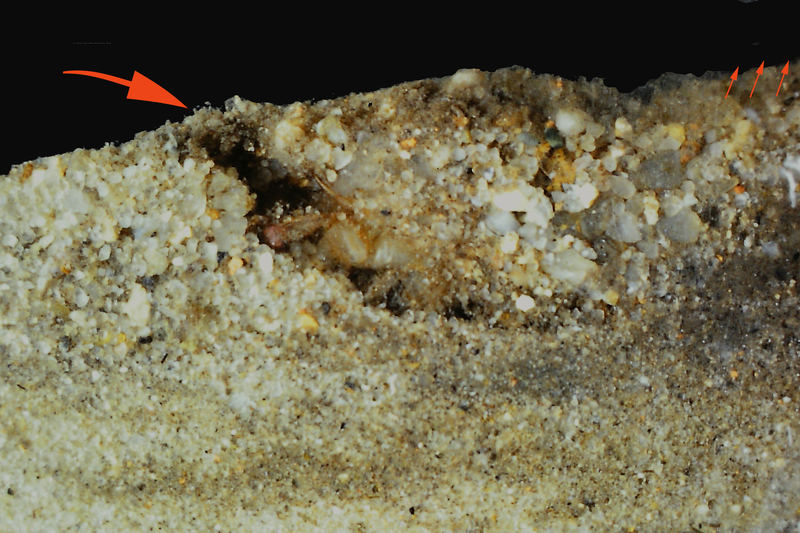 Coarse sand grains quickly resettle from the flow. Using a series of mouth brushes and palps, the larva swallows only the finest particles (average diameter about three one thousandths of a millimetre). Like many other animals feeding on particles of nutrient poor detritus (which other creatures may have already tried and found wanting) the mayfly larva has a brief gut retention time of perhaps fifty minutes, in which period it presumably strips off the most easily digested material from the relatively large surface area presented by the fine food particles. The adult mayfly, as its name suggests, normally emerges from the river in or about that time of the year. It is a feeble flier and thus is subject to severe depletion by strong winds in the period of emergence which may result in breeding failure and weak year classes two years later. Development is strongly temperature dependent and larvae reared in simple aquarium tanks at room temperature (well above natural river temperatures) have been seen to emerge several months in advance of the normal May-June period. The emerging larvae rise to the surface and as they drift downstream the winged fly merges through a dorsal split in the skin and (unless it is eaten by a fish or a bird) flies to the bankside vegetation”. Unfortunately for NZ anglers there are only two burrowing Mayflies species present locally and neither occur in high densities so they are not a reliable food source for trout. This means that the other two types are far more important. Clingers – the newly hatched nymph lives under stones or amongst the weeds where it clings tightly (e.g. March Browns and Blue winged Olives). While clingers have a flat body shape and strong claws to allow them to move effectively around the bottom and beneath stones they drift awkwardly in the current once dislodged and are easy prey for trout. This is the most abundant type of mayfly in NZ and the commonest ones are Deleatidium, Coloburiscus and Zephlebia (like a Zebra it is renowned for its striped legs and body). Swimming – upon hatching from the egg these nymphs find shelter and flit about the bottom from sanctuary to sanctuary. As these nymphs can swim rapidly for short distances using their stiff tail filaments and a undulating body movements they are also known as darters. the most common groups are Nesameletus, Oniscigaster and Ameletopsis and all three genera feature heavily in trout diets. A mayfly nymph, no matter to what class it may belong, feeds upon microscopic algae and other diatoms which are found upon the leaves of aquatic plants or under stones. At certain stages of its development the nymph sloughs off its chitinous outer skin to accommodate its increasing bulk. When it reaches maturity, and the wings have formed under the larval skin, the nymph swims to the surface. Once there the thorax splits and the wings are released from the wing covers. The subimago or dun then draws itself out of the larval skin or shuck, shakes its wings out of their folds and standing on the shuck floats downstream until it is able to launch itself into the air. Mayflies are an important trout food so they have justifiably captivated anglers for centuries. The more we know about their life cycles the easier it is to identify what trout are feeding on and select a suitable imitation to dupe them. For NZ anglers, it would be worth getting a copy of “Trout’s Larder – A guide to trout food in New Zealand streams” by Duncan Gray and Jens Zollhoefer (ISBN-13: 978 0 7900 1068 7) as this is an excellent treatise on the life cycles of all of the species likely to be encountered on the river bank.